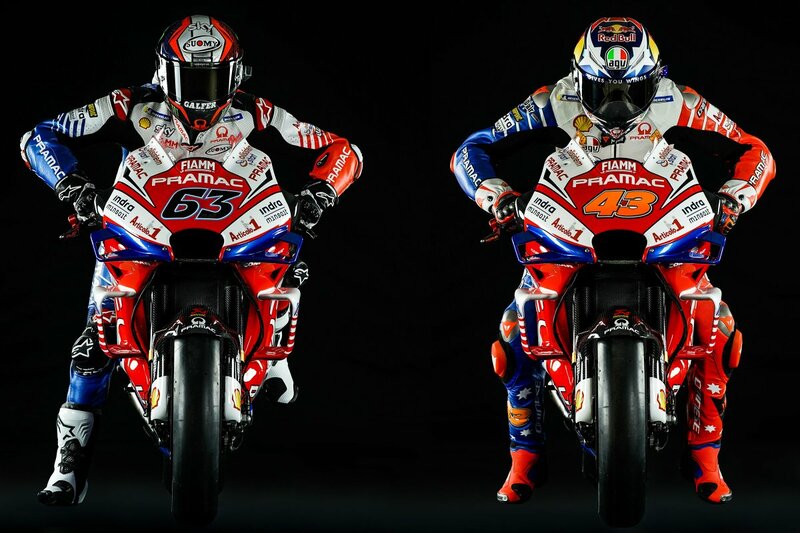 Jack Miller and new recruit Francesco Bagnaia were on hand to unveil Alma Pramac Ducati’s 2019 MotoGP livery in Milan following the final pre-season test which concluded earlier this week in Qatar. The Italian squad returned straight back from the Losail International Circuit to reveal its new season colours, which remain an unchanged red, white and blue but with a new design, having retained title sponsorship backing from Pramac. With Danilo Petrucci stepping up to the factory Ducati squad this year, Miller moves on to the factory-specification GP19 the team is running this season with Moto2 world champion Bagnaia graduating to the GP18 for his rookie premier class campaign. Both riders produced eye-catching pace during the recent winter tests, including lap record pace at Sepang, as the team looks to defend its MotoGP Independent teams’ title from last year after finishing fifth overall. “The 2018 season gave us great satisfaction as we won the Independent teams’ title,” Paolo Campinoti, team principal, said. “With the confirmation of Jack Miller, who will have at his disposal the Ducati Desmosedici GP 2019, and the great talent of the reigning Moto2 World Champion Francesco Bagnaia, in the 2019 season we aim to confirm ourselves at the very highest level. “We are also proud to tackle this new adventure with the fantastic livery designed by the Centro Stile Lamborghini, certain that they can create a winning combination with the Ducati Desmosedici GP. “This is a very important season for me,” Miller said. “I have the official version of the Ducati Desmosedici GP at my disposal and I have to show that I can be competitive fighting with the leading group. “I’m thrilled to be starting this new adventure with a team that from day one has been very present, very attentive and with great ambitions,” Bagnaia added. The Pramac Ducati squad returns to Qatar next week for the 2019 MotoGP season opener on March 8-10.